Flesh tunnels with pendant are the dernier cri in the tunnel scene. They are made of a classic ear tunnel or flesh plug and on its outer edge a stylisch pendant is attached. They are the new trend in tunnel - realm and can perfectly be worn in combination to other jewelry. In addition to the unostentatiously tunnels with pendants there are also ornamented plugs with pendants like plugs in the shape of a ship´s wheel. 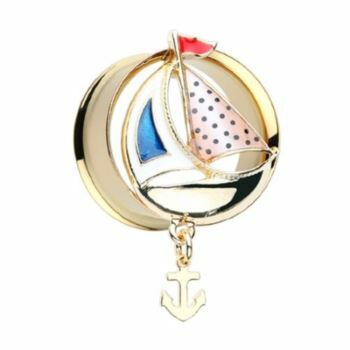 Because the maritime style is so popular at the moment you can also buy golden flesh tunnels with a ship in the middle and an anchor - pendant. Of course you can wear them all the year long but they perfectly fit to your spring and summer outfit. But we offer many other tunnels with pendants in our shop. For example tunnels with pendants in the shape of a key are also very popular. Just as popular especially with women are tunnels with hipp throwing star pendant. But you can also select from a large range of cool tunnels with anchor - pendants in various variations. Our silver ear tunnels with pendant are very popular as well. Therefore we want to introduce you these tunnels first. They are available in all sizes between 6mm and 16mm they shine very brightly because of the very high quality of the surgical steel they are made of. The pendants are very robust so that they can withstand the stresses of everyday life. Here great emphasis was placed on the best production quality. These tunnels are ordered very often in combination with the key - , throwing star - and anchor pendants. But let your imagination run free and select the tunnel with pendant that you personally like the best. If you like it more emo- or gothic styled you will probably rather prefer the black ear tunnels with pendant. They are also available in gauges between 6mm and 16mm most people also order these black tunnels with throwing star-, anchor- or key pendant. As mentioned above you can not only buy tunnels with pendant but also plugs with pendant here at flesh tunnel shop. Currently we recommend our plugs in the shape of a ship´s wheel with anchor - pendant and our flesh plugs with dreamcatcher - pendant. Additionally we permanently expand our product range so that it is worth klicking along to our shop to discover new tunnel jewelry.